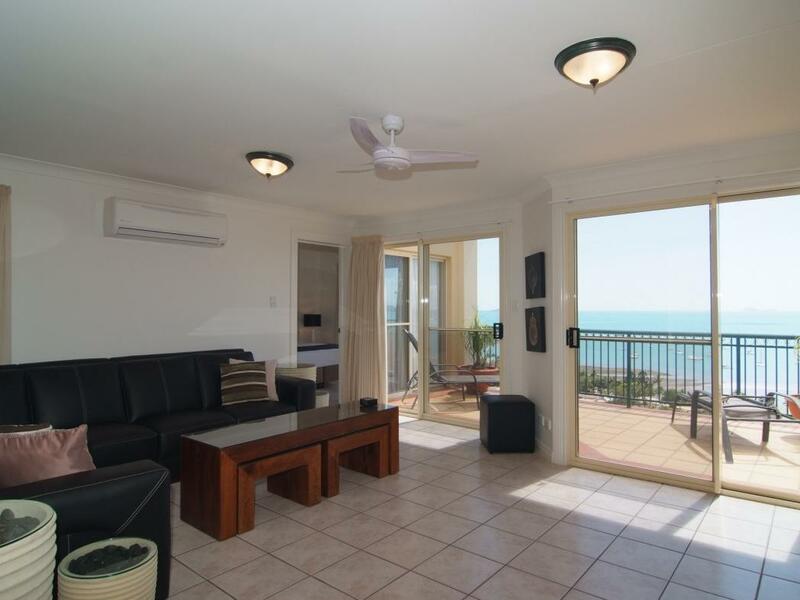 يقع في شاطئ إيرلي, Mediterranean Resorts إنه المكان الأنسب لاكتشاف Whitsunday Islands و ما يحيطها. يقع مركز المدينة على بعد فقط. ويمكن الوصول إلى المطار خلال دقيقة. 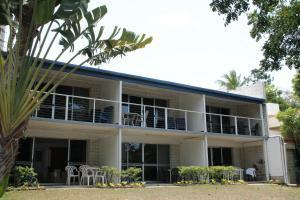 كما يمكن الوصول بسهولة إلى Whitsunday Doctors Service, The Doctors Airlie Beach, Abel Port Marina. يعمل Mediterranean Resorts على ضمان إقامة مريحة لضيوفه من خلال خدماته الممتازة وحسن ضيافته. يمكن للنزلاء الاستمتاع بالميزات التالية: واي فاي مجاني في جميع الغرف, مطبخ, تسجيل وصول/خروج سريع, تخزين الأمتعة, واي فاي في المناطق العامة أثناء إقامتهم في هذا المكان الرائع. بالإضافة لهذا,تتضمن كل غرف الضيوف مجموعة واسعة من وسائل الراحة . بعض الغرف توفر حتى تلفزيون بشاشة مسطحة, اتصال لاسلكي بالإنترنت, اتصال لاسلكي بشبكة الإنترنت (مجاني), حوض الاسترخاء, غرف لغير المدخنين لإرضاء أكثر الضيوف تطلباً. يمكنك طلب اللائحة الكاملة للخدمات في الفندق ومن بينها حوض استحمام ساخن, حمام سباحة خارجي. يحظى فندق Mediterranean Resorts بموقع ممتاز وخدمات يصعب منافستها. 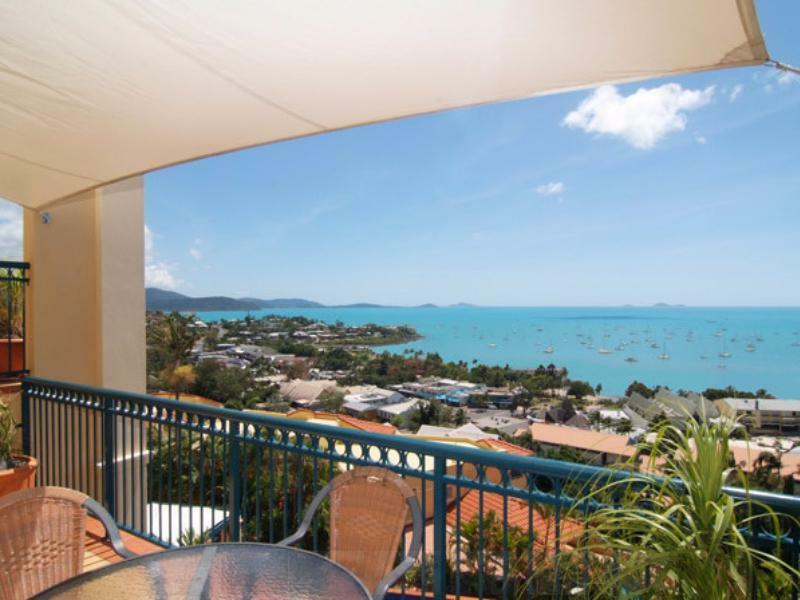 The apartment had a fantastic view of Airlie Beach and plenty of natural ventilation. The LCD TV and blue ray player worked fine, though they were connected with a cheap composite cable. There is a bit of wear and tear hear and there. And the shower heads were very ordinary. The tile floor wasn't the cleanest with my feet picking up plenty of black grit on the first day (could have done with a mop). It is also quite slippery when wet. Appliances were good but I'd prefer more than the minimum number of plates and bowls to reduce the washing. The wifi password we were given on the first day didn't work. Reception was attended infrequently. You had to ring a mobile to get service. Otherwise staff nice. There were no BBQs on site that we could fine but the two pools were fine. It's a steep walk to the apartments from town but it's good for the constitution. Air conditioning in every room (didn't need it). We were in apartment 2. It's definitely a 3 star apartment with a 5 star view. you have a whole apartment with living room and kitchen. very comfortable. great view from the balcony. quiet at night. nice outdoor pool (but we didn't use it). up a hill, so you need to walk up and down to go to the port and the restaurant area, but it is ok. The sea view is good. Near the supermarket, about 8 minutes walk. Unlike other hotel, we had to do the cleaning and dispose the rubbish. But it is acceptable. 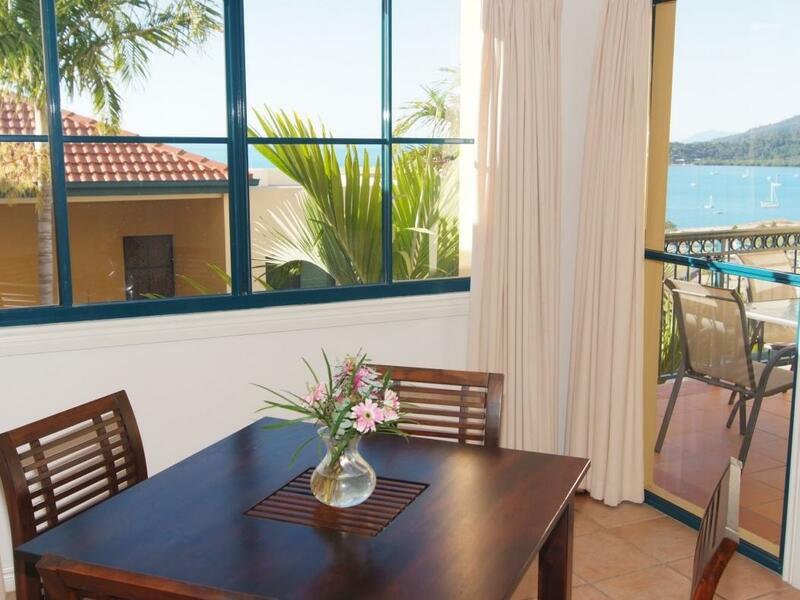 Nice rooms and good view from the balcony. Quiet and clean. Love the pool. Woolworths is just on the other side of the road at the bottom of the hill where the resorts located. We absolutely loved this place. When I first walked into reception to check in I thought oh no because it's quite cluttered and messy. But walking into our room was awesome. 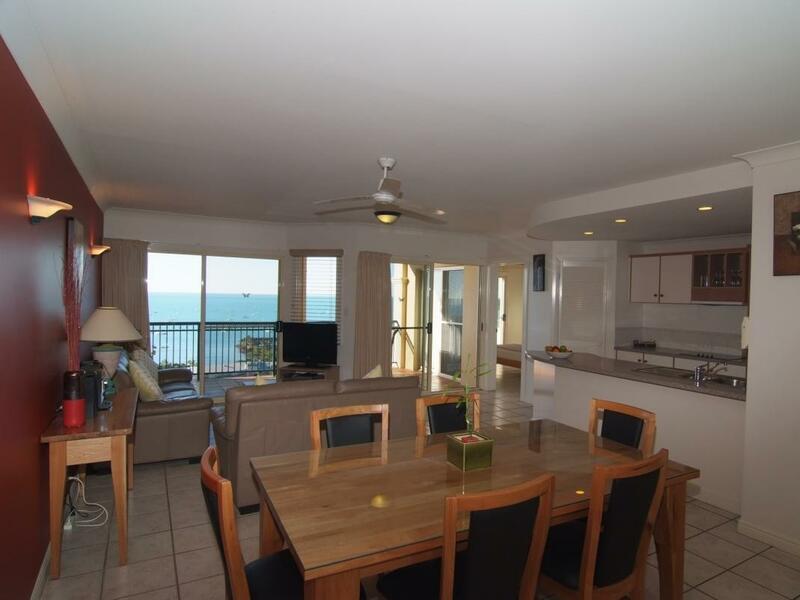 Huge tiled space, nothing fancy but everything you need has been thought of. Generous with tea coffee and sugar too unlike many places. The infinity pool is amazing. The rooftop spa is private with a great view. Big hill to walk up but it's only 5 minutes to the main strip if you're walking. Lots of great pubs nearby. Pop over to Anchor bar across the street when you're there it's a great poolside bar Bed was comfy, shower was great. My husband left his sunglasses by the pool for a couple of hours and they were stolen Bit annoying how it says to take your rubbish it and has these threats of cleaning fines if it's not up to scratch when you leave, however I've noticed that's an Aussie resort thing, we don't see that in Nz, if you pay for somewhere it's their job to clean up after you! I'm sure it meant if there was a lot of damage or filth but we even swept when we left just in case! This asked me to rate food but it has no food so Agoda should change that as it forces the overall score down Overall would definitely choose to stay here again we had a great time! Good, however we would not return would not recommend this hotel. Pricey, if your a Gamer forget connecting to the internet. If your a cook forget the kitchenware, it all lets you down. 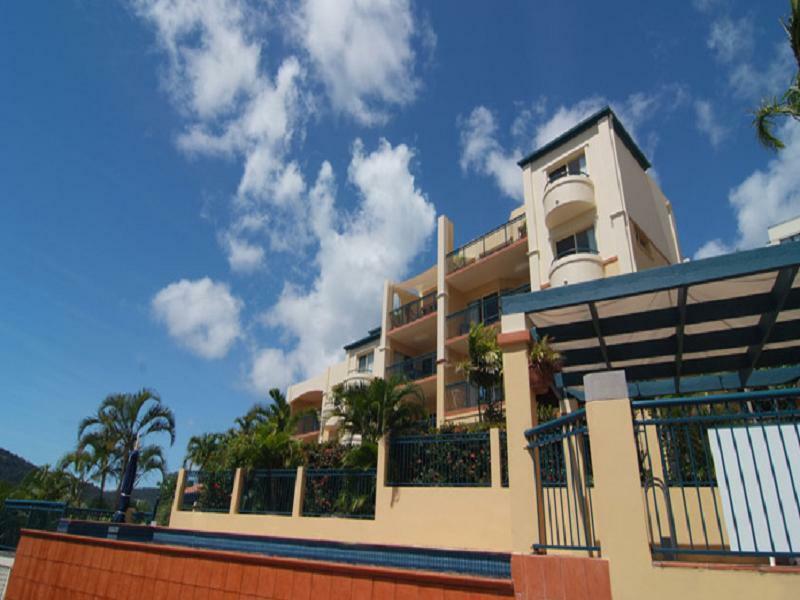 $250 visa debit which is practice so we were told, however having stayed out numerous hotels in the Whitsundays we Know this is not the case. Check in was not as suggests but later. Drills occurring mid afternoon one day and water cut of the next (courtesy call about the H2O). As we were staying only 2 nights, our experience was seen as a filler (not the exact term used by receptionist) hence the later check-in as advertised & no late check out (not that we asked) but were told anyhow. $780 for 2 nights I would have thought at least would allow for minimal Internet and a non-stick frypan and wine glass's that didn't break whenever you touch them. 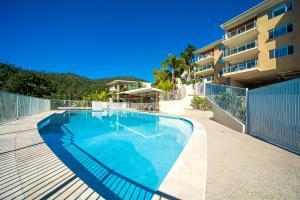 We will consider a different apartment resort when we next trip to the Whitsundays which will be December & April 2014. Balcony balustrades interrupt the great views, cant see any view if you're lying down in the Master bedroom, poor design!! 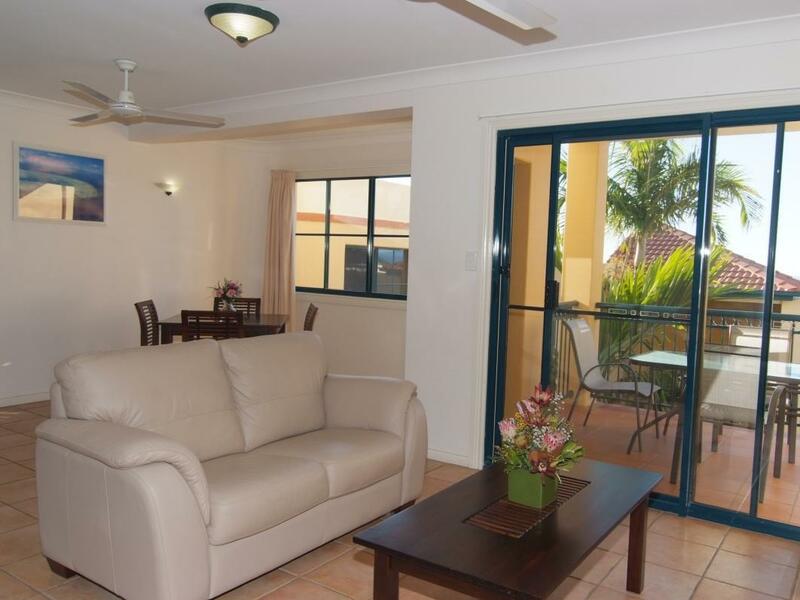 Our stay was very comfortable and the resort was very clean , we liked the location it was very conveniently located to cafes & restaurants in the town centre. it was ok hotel for reasonable price. but it had problem from check in because nobody stays in the reception and also till mid night, there was drunk young people having party in the swimming pool peeing in the pool and stuff. there was no staff to stop it either. it looks like only one woman handling the whole resort and when she goes to sleep, its out of control. das hotel befindet sich am ende einer steilen zufahrtsstrasse. uns hat der tägliche weg zum resort nicht gestört. wer jedoch schlecht zu fuß ist, sollte sich darauf einstellen und eventuell ein kfz mieten. die zimmer sind groß und gut ausgestattet. in der anlage ist es sehr ruhig. zwei pools und ein whirlpool sind eine willkommene gelegenheit zur abfrischung nach einem heissen tag.